My mom is a great, loving woman, and will care for this child, no doubt, but I am really really worried about telling her and seeing the disappointment on her face, even if it’s unintended. I am also really nervous that she will treat my brother’s future biological children differently than mine. I realize I’m speaking in “what ifs” but I was wondering if anyone has come to you with similar issues? 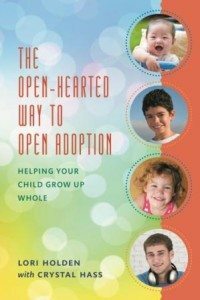 Worrying about acceptance from the rest of the family in an adoption, especially an open adoption, which I’m sure my family will find challenging. These are big issues for sure, Jeannine. I see two main ones. #1. Boundaries. As you set out to create and sustain a well-functioning open adoption, it’s going to be imperative that you know what healthy boundaries are and how to set and patrol them. Healthy boundaries let in as many benefits and connections as possible yet aim to keep out possible difficult or harmful elements. Having healthy boundaries is an ongoing challenge in relationships that are emotionally charged. Such as those with our own parents. You can use this pre-adoption time to fully move into autonomy with your parents. Make sure your mom’s concerns are heard and she knows you value her, but then you and your husband must make the best possible decisions for you and your child. You would expect your mom to honor this. And if she will not or can not, that becomes her issue and not yours. You continue to love her, listen to her concerns, value her, and yet still do what you feel is best and kind. Just as you will with your future child’s birth parents. #2. Less Thans. There are a few clues in your letter that make me wonder if there is a part of YOU that thinks adoption is less than. You say you have assured your mom that you will give her a grandchild who will look like us and share our genes. I wonder if you have thought what reading those words may mean to your future child as a teenager or young adult. Can you see how this sentiment might make them feel that you think they’re not in the same league as your anticipated biological children? I understand your prompt to write this letter was your mother, but I suggest that you look within to see if there is a teeny-weeny part of you that thinks adoption is “less-than.” Of course, you don’t need to share your answers with me or anyone. The point is that YOU take a look. If nothing is there? Great, you know you’re clear. If something IS there, you have time to examine and resolve your beliefs before a baby is tasked with dealing with all that. Let’s look at this piece: I am also really nervous that she will treat my brother’s future biological children differently than mine. First of all, this will, in the future, either be a valid worry or it won’t. If it is does not come to pass that your mom treats a child by adoption differently than a child by biology, you are not doing yourself any favors by worrying about it this far ahead of time. And if it DOES turn out to be a valid worry, you will deal with it. You will have to protect your child from the devastating effects of sensing they are less-than, when people in your family are operating from such an orientation. 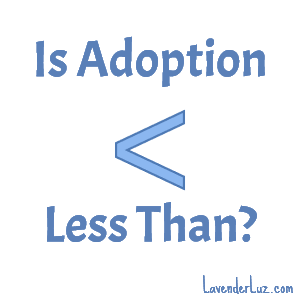 It sounds like your family members think they know about adoption, but I’m guessing they don’t have any direct experience with it. Yet. This brings us to second of all. You will teach your family about love that goes beyond blood and the myriad ways people can be connected through their lives and hearts. Your family members are on a journey, too, remember. You will teach them about the experience of being adopted (which adoptive parents must understand can too easily mean “othered”). How will you do this? 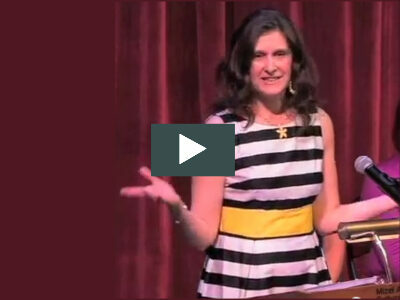 You yourself will be exploring the adoptee experience. I encourage you to begin reading adoptee blogs and memoirs. To the degree you can understand the experience of being trans-familied (adopted), you will be in a better position to walk alongside your child in his/her journey. You will do what you can to ensure that your child is fully loved and accepted by you and your family, by the people in closest contact with him/her. You’ll set in place healthy boundaries to that end. And then you will let go of the rest. Kind of like the Serenity Prayer, in which you ask for the courage to change what you can, accept what you cannot, and have the wisdom to know the difference. You must make sure your child is loved unconditionally and immeasurably by those in his/her inner circle. Any vibes to the contrary have the potential to be devastating to your child. I implore you to better understand all this before you become a parent by adoption. Dear Readers, what advice do you have for Jeannine? How Do We Set Boundaries Yet Still Stay Open? Readers, please weigh in thoughtfully and respectfully. This is a teaching endeavor, not a shaming endeavor. We we aim to bring light rather than heat. People do the best they can with what they have to work with, and our goal is to give folks more to work with. I’m old, so I tend to take the long view. Like everyone in the history of parents and children, you’ll find that your plans and worries before becoming a parent look different in the reality of raising your kids. I think Lori’s absolutely right that one good use of the time between deciding you want to adopt and actually becoming parents is to think through the fact that no matter how your family members respond, your family dynamic is going to change. If you get along great with your parents, you may not have had to think about, let alone practice, setting boundaries while still loving them dearly. If you’re young yet, you may not fully realize that you can’t necessarily keep a promise like giving your mom a genetically related grandchild. I was shocked and hurt when neither my mother nor my mother-in-law were enthusiastic about our adoption plans. They made various dire predictions about our choices and then. They got together and offered to pay for further infertility treatments to dissuade us. After more than 30 years I can still bring back those feelings. I now think that finding the strength to remind them both that we were not asking permission, just sharing our decision, was a great first step toward becoming our children’s advocates first and foremost. When we adopted a second time, and when we fully opened our adoptions, we got more parental heat, but by then everyone knew that it was just an exchange of opinions that wouldn’t change the results. In my own heart, I promised my kids that I would remember to actually treat them like adults once they were adults. And both grandmas did come around eventually and got joy from their grandchildren. It’s not your job or necessarily within your power to give your mom a grandchild who looks like her, or any grandchild at all. All you can do is treat her lovingly as you all do the best you can with what life brings. I especially love how you clarify “not asking permission” and “sharing a decision.” So important to understand the distinction in situations like these. “There are a few clues in your letter that make me wonder if there is a part of YOU that thinks adoption is less than. You say you have assured your mom that you will give her a grandchild who will look like us and share our genes. Many of us feel this way. Less than. And it’s takes a great deal of time and work to overcome. My snarky comment is this: get a puppy first. Lori’s advice is spot on, as usual. I recommend you definitely read her book as well as the links to blogs she recommends. One thing I will add about adoption that has come up for us is that all kids who are adopted come to us with trauma that needs to be addressed and recognized. It is a hard truth to learn and one that the agencies don’t do a good job teaching us. Because of this, we’ve had some personal experiences with family where it’s clear they don’t get the needs of our children. It’s a tough road to travel. Lori, you are such a great advocate for everyone, but especially the adoptee. I was thinking the same thing, that the assurance to Jeannine’s mom that there will be biological children that will share your genes made me cringe, because it definitely made adoption sound “less than.” Like, “we’re going to adopt this child, and I need you to accept both the child and his/her birth parents, but don’t worry, we’ll have kids of our own too so that’ll make you happy.” It didn’t sound quite right with adoption being a true first choice. I agree that reading Lori’s book and seeking out blogs and adoptee perspectives will be immensely helpful. I think that viewing adoption from the perspective of the child first and trying to anticipate any complications (if you have a child through adoption and you have a biological child there may be dynamics you have to work through for everyone, if you have two children through adoption and they have very different birthparent scenarios that can also be challenging), with the thought of preparing to understand rather than worrying. If that makes sense. I also liked the book In On It, a book for families & friends of someone adopting to sort of lay out information about adoption and helpful/unhelpful things. 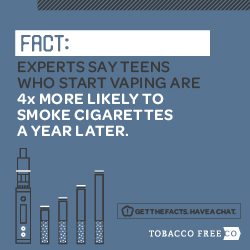 It can help open the conversation. A lot of older family members look at adoption very differently, and when we were going down that path I struggled a lot with continuously explaining why open adoption was important and why “those people” needed a seat at the table, as for older generations who haven’t experienced the adoptee or birthparent side of things it may have seemed “simpler” when it wasn’t quite so connected. Education is key, as Lori said! And honoring your immediate family and child’s needs before others.